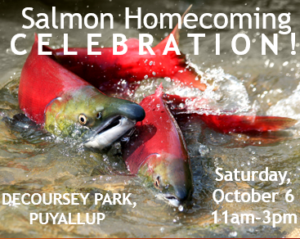 This is a free community event that includes music, storytelling, food and nonprofit vendors, guided walking tours along Clarks Creek to see the spawning salmon, along with educational booths and interactive activities for children and their families about the watershed. We had about 2,000 visitors at last year’s event! Please join us this year at DeCoursey Park. The WDFW Puyallup hatchery grounds will be closed due to a major constructions project this fall.